NOTE: This API is still in beta. URLs and API signatures may change. See the Release Notes for information on new features and known issues. The Map API enables you to create web pages that have web map functionality, using maps of Second Life, rather than Earth. In general, the default map interface looks as shown here. Click and drag the mouse pointer to pan the map around. Double-click to zoom in by one level (power of two). Click anywhere on the map to open a "teleport" popup (see Teleport popup below). Use the mouse wheel to zoom in and out. See Zoom levels for more information about zoom levels. Use the zoom controls at upper left to zoom the view in and out. Clicking anywhere on the map opens a popup (left) where you click. Click "Visit this location" to start the Second Life Viewer & teleport you where you clicked. This feature is implemented with the gotoSLURL() global function. See Map API Basic Examples for a detailed explanation of the working examples at http://maps.secondlife.com/examples/. 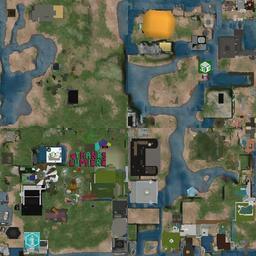 The web site uses the Map API to provide a mechanism to teleport directly to locations in Second Life from web pages. For more information, see Using Second Life URLs (SLurls). All the examples also require additional script statements in the HTML header. Other browsers may work but little issues may appear. Unless otherwise noted, all features work in all supported browsers. If you encounter problems or bugs or have feature requests, please email webmap@secondlife.com. Happy coding from the Second Life Web team! The Map API is built around the Leaflet web map library. Leaflet provides many options, methods & events for customizing the presentation of your Second Life map. Map coordinates are based on the Second Life grid system for positioning regions. As illustrated in the diagram above, the Map API maps the Second Life world to the upper right quadrant of an earth map. A large scaling value equal to 220 or 1,048,576 defines the largest region coordinate at the top and far right edge of the displayed area. This value creates a map area with room for one trillion sims. 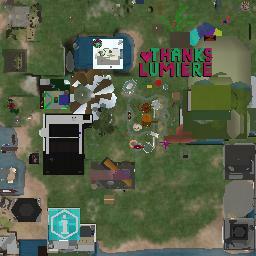 The little blue square illustrates where the populated sims are in Second Life. There are eight zoom levels: one through eight. Zoom level 8 is most zoomed in, and zoom level 1 is most zoomed out. Each level zooms by a power of two. In other words, at zoom level six, each region is twice the width it was at zoom level five. x & y - the X and Y coordinates on the Second Life Grid of the region. For example, region Ahern is (997, 1002). Note that 2Z - 1 is the number of regions encompassed by the width of a tile at resolution Z. 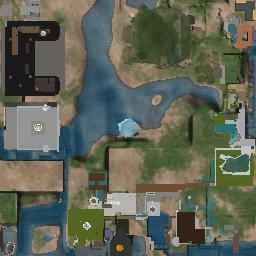 The map generation process is more scalable than the previous release, and is able to image the entire Second Life grid of about 30,000 regions in less than two days. There is a "decay period" for offline regions. If a region is disabled, the tile will stay up for several days (in case it comes back or something else has gone wrong) before the tile disappears. That several-day period will be longer than the time it takes to update existing regions or put new regions on the map. This section describes new features and known issues with the current release of the Map API. Version 2 of the Map API was released on Dec 12, 2016. Converted the Map API to Leaflet. Version 1 of the Map API was released on Jan 15, 2009. See also Philip Linden's blog post announcement. This page was last modified on 13 December 2016, at 12:14. This page has been accessed 57,256 times.